My husband and I moved from Woodstock to the Rondout in Kingston in 2009, about five months pregnant with our second child. Owen is from a big Irish Catholic family, so when we learned that our closing date would be St. Patrick’s Day, we took it as a good sign. We participated in the Shamrock Run with eight of his siblings and their significant others, as our introduction to the neighborhood. This was our first home, and we lived there for six years, falling in love with Kingston, making friends with our neighbors, and appreciating the energy coming into the community. We were here for the building of the new walkway by the creek, and watched as three neighboring abandoned buildings were renovated. Like most of my neighbors on the Rondout, I didn’t know much more about the proposed Irish Cultural Center other than which lot it was planned for on Abeel Street. So when my family started to consider putting in a bid on the house next door to it (a home large enough for our family of three children and my mother, whom we wanted to move to the Rondout along with us) in the fall of 2014, I decided to look into it. At that time, there wasn’t a site plan on the website, and to this day, there’s still no phone number. But I tracked down a member of the Irish Cultural Center of the Hudson Valley (ICCHV) and learned that it would be classrooms and a theater, which sounded like a wonderful idea. We were successful at bidding on the new house, getting multiple offers on our old house, and selling my mother’s place in Woodstock. We moved to Abeel Street at the end of June 2015 and enjoyed July 4th with our new ICCHV neighbors. We began to call city officials at the Planning and Building Departments, as well as the ICCHV to figure out what was happening. Each person we spoke with had a different answer to our questions. The information from the ICCHV and the City’s departments didn’t agree, and it often changed the next time we called. Finally, someone suggested we go to the next Planning Board meeting at City Hall to make our concerns known. In the years we spent as home owners in Kingston, we kept abreast of national politics, but Owen and I never got involved with local politics beyond chatting with candidates and canvassers who came to the door. The only time either of us had been inside City Hall prior to 2015 was when Owen consulted with the City’s Historic Landmarks Preservation Commission (HLPC) before making small renovations to our old home’s street side exterior, knowing we lived in an historic district. 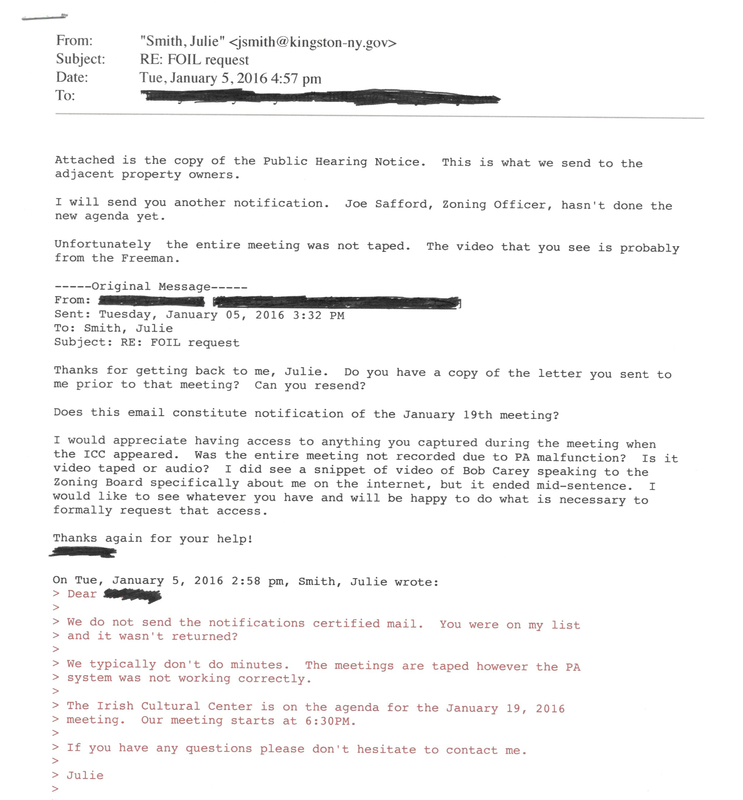 We didn’t know about the different city departments or when they met or if and how the public was allowed to participate at any given meeting. We followed the suggestions of city officials as we tried to understand the ICCHV proposal and catch up on how it had happened that the project was not in compliance with the zoning codes for Abeel Street. We talked with neighbors and local businesses and tried to learn why no one knew how big it was planned to be or that it was planned to be a wedding venue and bar along with the theater and class offerings. One of the first people we befriended was the adjacent property owner on the other side of the ICCHV lot, Deanna Baum. Her place is an apartment building, and a tenant had been upset to report that the ICCHV cut trees on Company Hill Path upon purchasing the adjacent parcel in 2013. Deanna had been following the ICCHV’s developments but didn’t understand how certain things had happened because they didn’t follow the process for projects like these. 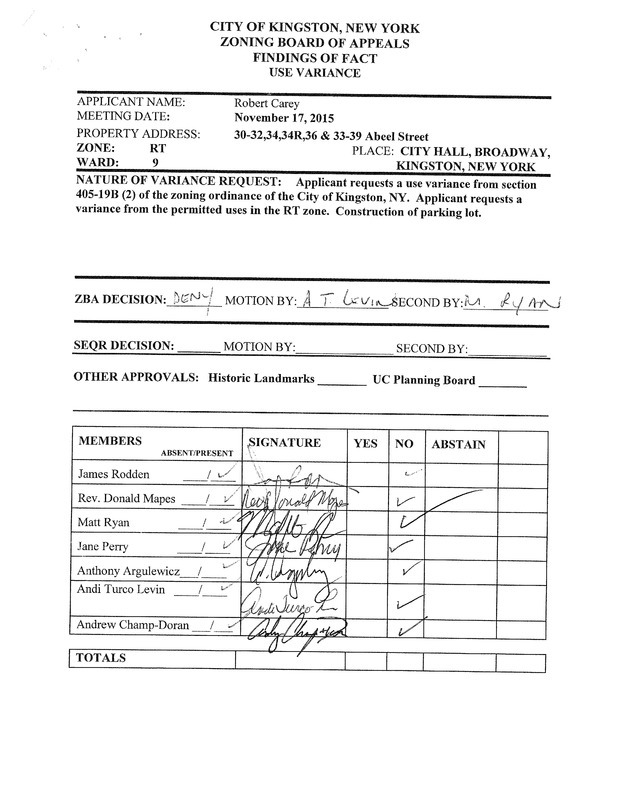 The ICCHV wasn’t being required to seek variances for certain things that weren’t allowed by the zoning codes (like use variances for the bar and banquet hall), but they did need variances for other things (sideyard setbacks, landscaping nonconformity, and a use variance for the planned parking lot across the street). VIEW The State Historic Preservation Office, in charge of overseeing the landmark Rondout-West Strand Historic District listed on the State and National Register of Historic Places, hadn’t been consulted on the ICCHV’s first application. I made a statement at the Planning Board meeting of November 9th, 2015, during the public comment period, voicing concerns about the project’s size, scope, and impacts on quality of life. I have a huge fear of public speaking and abhor attending meetings and left soon after I spoke. I was invited to go to the Building Department to meet with the Clerk and the Zoning Enforcement Officer (ZEO). During the meeting, I was able to FOIL (have copied) the file on the ICCHV, and learned the ZEO’s thinking around the zoning for the project. Because a portion of the property is shown on the tax map as touching West Strand Street, he felt that the project can assume the zoning codes for that street, even while he told me that the zoning was consistent for all of the R-T district (the Rondout). It was confusing, and I knew, from my limited home ownership, that tax maps were not a reliable resource. When I complained about there being a proposed 30-foot brick wall at my property line, which would impact my quality of life and views, the ZEO said that the ICCHV’s Executive Director helped him get his first job, and joked that I should teach my kids to play handball. I left the meeting feeling defeated and hopeless. Later, city board members took us aside and said that no one was going to listen to us unless we got a lawyer. Realizing that the lack of clarity in the process that we were encountering had also helped to create the confusion within the Rondout community, and that the project would not only impact my family, but all of us in the neighborhood, we committed to taking this suggestion seriously. But we quickly learned that we couldn’t hire a lawyer from Kingston as the people involved with the ICCHV were well connected. Our assembly member is involved in the project’s design as both a member of the ICCHV’s parent organization, the AOH, and as someone who secured state funds for the proposal. VIEW (Times Herald Record) and VIEW (Assemblyman 2015 Year in Review). So we found a land use attorney from Rhinebeck and hired him in early January 2016. Now tuned into the city’s record-keeping, we tried to keep track of the different city boards, when they met, when they notified the public about the meetings and the agendas for them, and found that there wasn’t any consistency. The Planning Board takes minutes by hand and publishes them on the city’s website. The ZBA meetings are recorded but minutes were not distributed on the city’s website until recently. It’s city law that notification must be in five business days prior to the meeting, but it’s not clear if they must be sent or received five days prior. Other committees publish everything or nothing on the city’s website, depending on the chair. What happens when the agenda changes for a meeting the day of the meeting? What happens if there are no minutes from a meeting? The availability of information on public meetings has been the most difficult aspect for us. The sitting mayor is working to remedy the situation, which is great, because without a clear system, citizens can be excluded. Another issue our lawyer pointed out was that many of the proposed uses for the ICCHV weren’t allowed by the zoning codes. On May 6th, 2016, he asked the ZEO to make a determination about whether or not the ICCHV’s property has “direct frontage” on West Strand, as required by the zoning codes in order to allow for the planned uses of the proposed building. 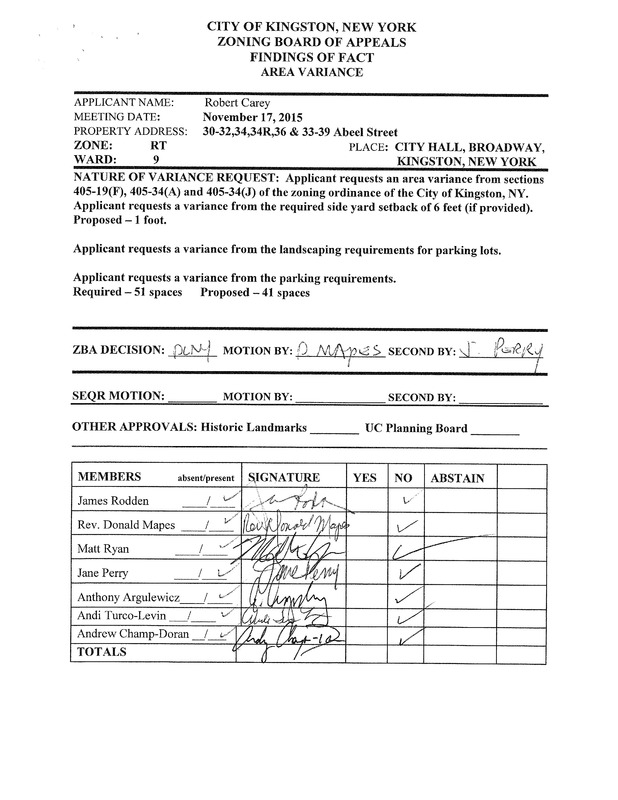 On June 13th, after a second request from our attorney, the ZEO made the determination that the ICCHV’s parcel “abuts West Strand,” just hours before the Planning Board meeting that evening. VIEW The determination was announced by the ICCHV’s lawyer to the Planning Board, and it was clear that the board members didn’t know anything about it. Considering we had only just heard the determination ourselves, we didn’t understand how the ICCHV’s lawyer already knew or how it was his responsibility, rather than the City Planner’s or the ZEO’s, to notify the Planning Board. Two months later, we received by certified mail, a notice about an upcoming ZBA meeting that would be held in two business days. On November 15th, we attended, and the ZBA decided in favor of the ZEO against our appeal. This establishes Company Hill Path as a sidewalk for West Strand Street, and stipulates the ICCHV entrance must front on Company Hill Path. VIEW The decision was not available for us to review that evening, and we were told to ask the Building Department for it. The next day, I emailed the Clerk to request the written decision from the ZBA as well as all supporting documents. She said it will be filed with the City Clerk and available five days after. Unsure if the decision would include the supporting documents, I requested to specifically FOIL the survey that was cited as important to the decision. She sent the package a few hours later. I didn’t understand how she could cite a specific timeframe for the process (five days), and then be able to send it to me within hours. Our lawyer submitted a FOIL request for further supporting material to weigh our options in pursuing an Article 78 to challenge the decision. He was told these documents would not be available until the day following the deadline for filing an Article 78. Soon after we hired a lawyer in January 2016, the then-new mayor determined that there should be a liaison at every meeting concerning the ICCHV, and that usually fell to the City’s Planner or the City’s Assistant Corporation Counsel. We always asked for permission to address the various boards that don’t have a designated public speaking time, trying to be respectful of the process that we knew we weren’t clear on. Sometimes we were allowed to speak and other times we were not. The protocol seemed to be up to the discretion of Assistant Corporation Counsel at any given meeting. Recently, on October 6th, 2016, Owen, Deanna, and I attended the HLPC meeting, because the ICCHV was on the agenda. We listened as various people presented their projects, votes were taken, recommendations and approvals were made. Then we learned that the ICCHV had withdrawn their item from the agenda for that evening. We asked to speak to the Commission on the topic and were told by Assistant Corporation Counsel that we couldn’t unless the Commission voted no on the application and there was a public hearing. We argued that we should be allowed to participate prior to a vote. It was unresolved that evening. Afterwards, I emailed the HLPC’s secretary and asked that the conversation be included in the minutes for the meeting. She replied that the meeting was invalid as there was no quorum that evening, and sent the minutes which reflected that. I wondered if that meant all the votes and decisions made that evening would be negated as well. The next week, we were told by the City’s Planner that because we had retained a lawyer, we could no longer reach out directly to her and would have to do so only through our lawyer, which placed us in the position of needing to hire our lawyer every time we had a question for the department or comment to make at a public meeting that didn’t have a public comment period. We didn’t understand why, if this was policy, it wasn’t brought up ten months earlier when we had hired the lawyer and made that known to the city. Still, on November 3rd, 2016, we returned to the HLPC meeting with our lawyer. None of the applications we saw the previous month came back for new votes now that there was a quorum. After the ICCHV presented their recently updated proposal during a workshop/informational session, our lawyer was allowed to address the Commission to explain the neighbors’ concerns, and point out how they were echoed by a letter from the State Historic Preservation Office. Our supporting documents and images were submitted to the Building Department, and Assistant Corporation Counsel said he would review them before determining whether or not they would be submitted, all or in part, to the HLPC. 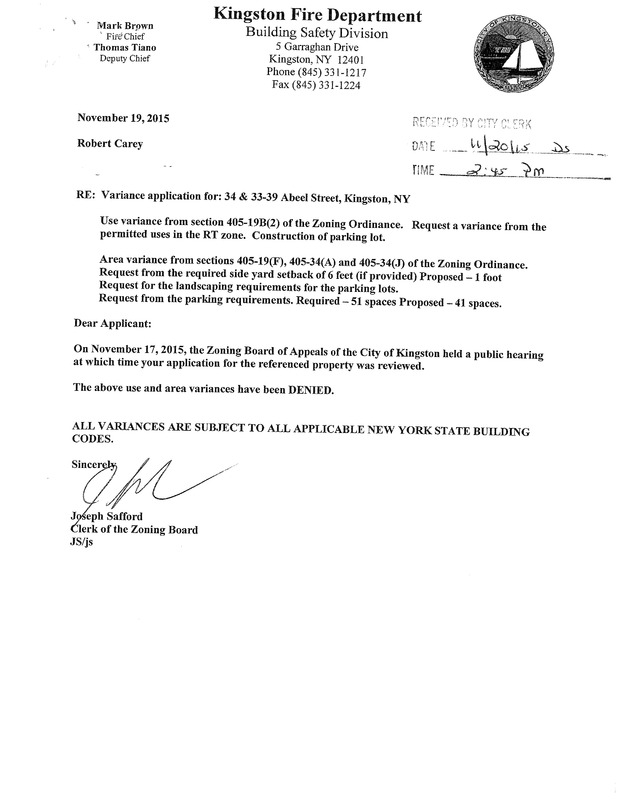 We hope that the Planning Board will align itself with these careful reviews that have been made, and make a Positive Declaration determination on the ICCHV’s SEQR Action so that these environmental impacts can be adequately studied and mitigated in cooperation with the city of Kingston and with the residents and small businesses of this neighborhood. We know this would ultimately lead to a stronger proposal, more in keeping with the character of the historic district, and certainly a more welcomed Irish Cultural Center. In sharing our experiences here, we aim to point out that the lack of clear process that we’ve noticed are not specific to the ICCHV project proposal. But remedying these issues would work to help all citizens be better able to engage with local government. We would like to see the changes in laws and regulations that are at least coincidentally paving the way for the ICCHV project to be monitored by the city rather than by citizens. And we would like to see some conformity around making information publicly available. It would be nice, too, if there was some city facility to help mediate relationships and share information between developers and neighbors so that neighbors of future proposals won’t need to fight their way into visibility during a project’s review. Our experience has given us the sense that as long as there is a lack of transparency or clear process, local government will only work to benefit some. In the current systems, it feels like the public can do everything within their power and yet still feel ineffectual and unheard. With the recent election, people are invigorated to participate in the public sphere. And I think local government is a space where we can be of real service to our communities. It is at City Hall that citizens should be able to impact projects that will affect us, and keep abreast of changes in local systems that might undermine or enhance policies of inclusion and public protection. Who will be the next citizen to try to understand the process? Will the experience be similar, or will it be streamlined? The public will need to engage to find out. PETITION: Citizens Maintain Request for Pos Dec in SEQR for Irish Cultural Center of HV’s Proposal.